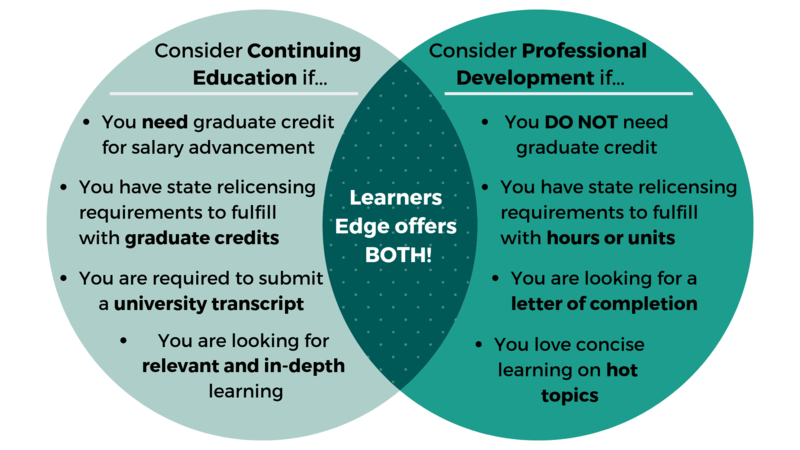 Below is a summary of how Learners Edge may help your continuing education and Washington teaching license renewal needs. This summary should in no way release individuals from their responsibility of ensuring that the course they take meets their professional needs. We hope it provides assistance in understanding how Learners Edge might help you in the accumulation of clock hours or graduate credit for salary advancement and the Washington teaching relicensure process. See the Washington Office of Superintendent of Public Instruction website for complete WA teacher relicensure information. Teachers must hold a valid initial teaching certificate, OR if your initial certificate has expired as of 9/1/2000 or later and you met requirements for renewal before expiration, you can apply late. After 9/1/00 teachers must hold a valid initial teaching certificate to apply for the continuing certificate. Must have a master's degree from an accredited college/university OR45 quarter hours (30 semester hours) of upper division or graduate-level post baccalaureate study (coursework at the 100 level is allowed when used to obtain an endorsement). 180 days of teaching experience, 30 days of which must be in one school district. Substitute teaching, out-of-state teaching, and teaching in more than one district is acceptable.